Everything you need to add a sub to your Bose stereo and eliminate the dreaded feedback associated with the Active Noise Cancellation (ANC) feature. Provides 3-channel Stereo Output For Adding Additional Amplfiers ie a Subwoofer Amp. Easy Plug and Play installation. Anyone can install this device and is done completely from the trunk in seconds. No other sound functions are lost. Bluetooth, Onstar, Chimes are all retained. A very valuable tool if you intend to do any kind of wiring to the car's audio system. This will save you lots of time and hassle. 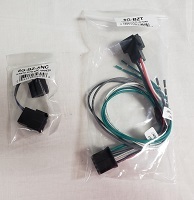 The 6G-BZ-ANC Active Noise Cancellation Defeat harness simply plugs inline at the X3 connector (connector closes to the rear of the car) and deactivates the microphones and thus will prevent the dreaded ANC feedback. What is ANC you ask? Active Noise Cancellation aka ANC is present on Bose Stereos and uses microphones hidden in the door panels of your truck to pick up in-cabin noise. The mics send this information to the amp, which in-turn sends offsetting signals out to all the speakers in the vehicle to help quiet the cabin. This is a great technological feature until an aftermarket subwoofer is installed in the vehicle. The microphones begin to pick up the extra bass tones from the new subwoofer and proceed to pump the loud offsetting tones thru all the speakers and sub(s), resulting in a vicious cycle of obnoxious sound. Hence, the dreaded feedback that will persist until the ANC system is defeated. Our defeat harness is the easiest way to disable the anc. It's simply plug and play and can easily be put back to stock at any time. There are no wires to cut or mics to locate or door panels to pry off, simply plug the harness in at the amp and your finished. Note: Bose systems have digital inputs from the radio to the amp, which cannot be interecepted for adding amplifiers. Therefore our harness borrows the audio signal 'after' the amp, which is a high level signal--hence no rca jacks. Therefore, you will need to use an amp with signal sensing high level input capabilities OR a signal processor with signal sensing input to trigger on your amp. Can be extended by user as needed. Note: Please be sure your truck has the BOSE Amp, which can be found behind the glove box. The BOSE Amp has Diagonal Fins. See Example Photo under the More Images Tab Above. If your truck has No amp at all, then we have no harness for those non amp applications at present.